The Firecracker, deep dish from Moondoggy's Pizza and Pub, downtown. The moon on the wall at Moondoggy's Pizza and Pub wears a big grin. That look was reflected today on the faces of diners who became the first-day early adopters of the new downtown eatery that serves more than just pizza. I'm sure I was smiling when biting into the surprisingly light (feeling, not calories) deep-dish pizza that Chip Chandler and I ordered. But let me start from the beginning. Moondoggy's is an Italian restaurant established in Brunswick, Georgia, that now has a second location in Amarillo at the F.W. Woolworth Building at 626 S. Polk St.
New Commerce Partners, the umbrella company for building owner 79101 Properties, recruited James Allen, Brandy Johns and Ranesha Reynolds, who are in the restaurant business as DRJ Elite, to bring the concept to Amarillo. Moondoggy's menu offers a variety of pub-food tastes: pizza, of course, pasta, sandwiches, salads. We started with the Cheesebread because — well, who wouldn't? Pizza dough folded in half, overstuffed with mozzerella, dabbed with garlic butter and baked? 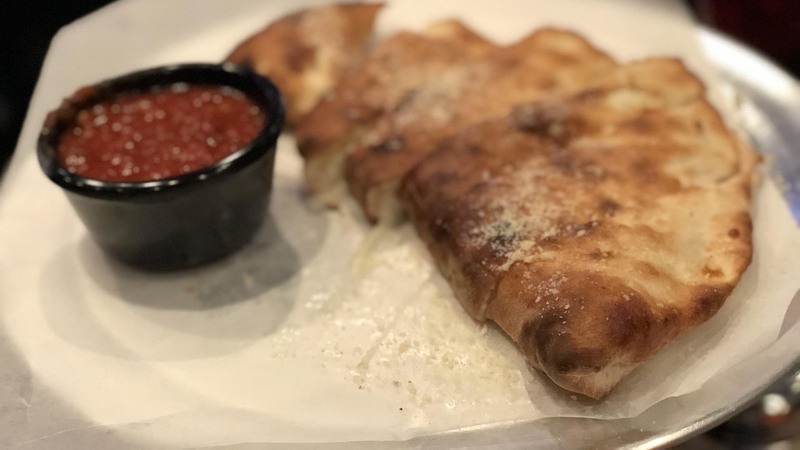 Extra cheesy Cheesebread is among Moondoggy's appetizers. Jordan, who works at the Georgia Mondoggy's but is helping out here, told us that customers there get addicted. I'm thinking they will here, too. But then he told us about the wings. They're baked, not fried. Soooo, we tried the wings with Old Bay seasoning and a chunky blue cheese. Another winner. 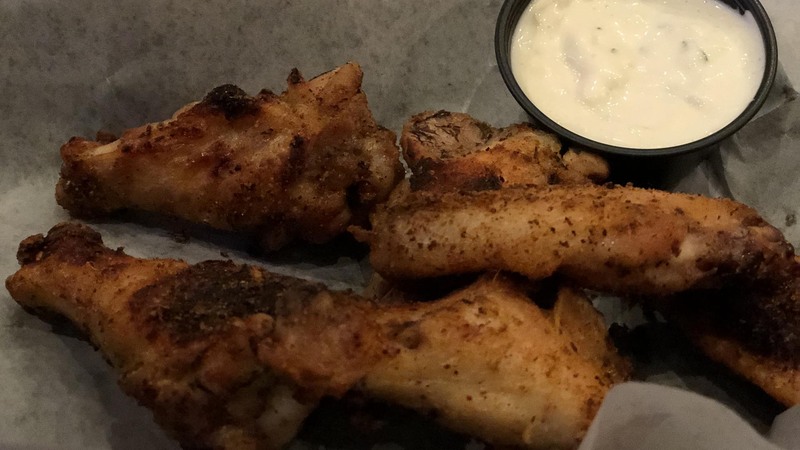 Wings at Moondoggy's are baked, not fried. Our table went both pizza and pasta for the main course. 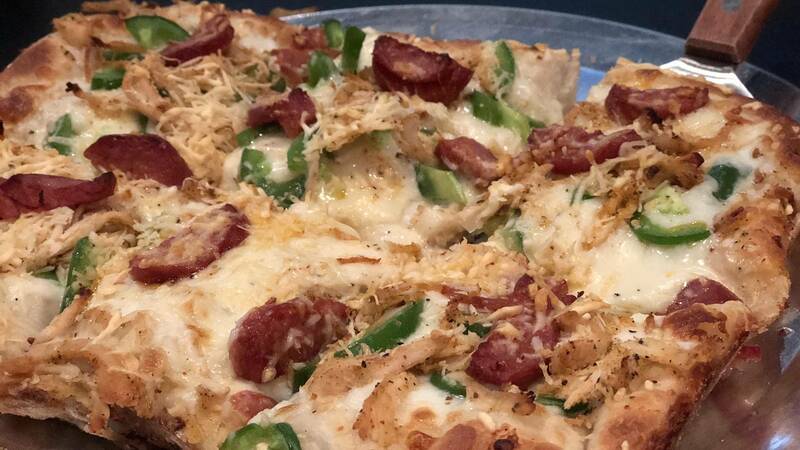 For spice fans, there's the Firecracker: blackened chicken, Andouille sausage, mozz and parmesan on an Alfredo base. It hits all the right notes, and the fresh jalapenos — not baked with the pie — are a nice crispy touch. 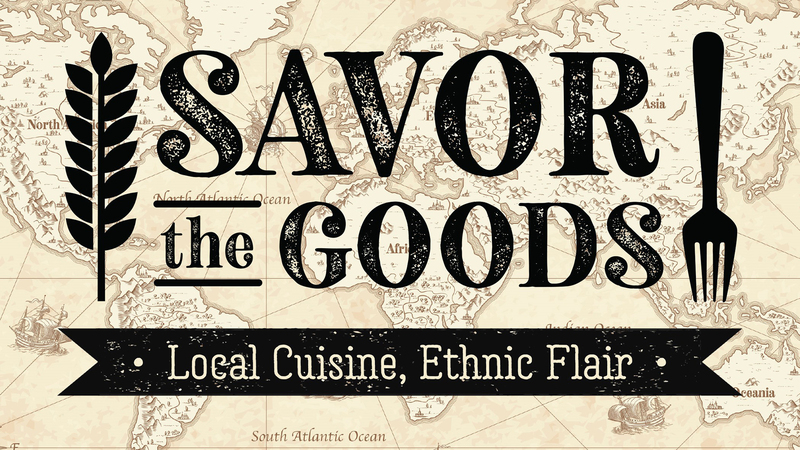 If spice is not your thing, there are plenty of other choices. We ordered ours as a deep dish because we were told they let their dough rise twice so it's not so heavy. (Again, density, not calories.) But pizzas can be ordered with thin crust, too. Sizes start at an 8- x 8-inch deep dish or 10-inch diameter thin crust and top out at a large 10- x 13-inch deep dish and 16-inch diameter thin crust. 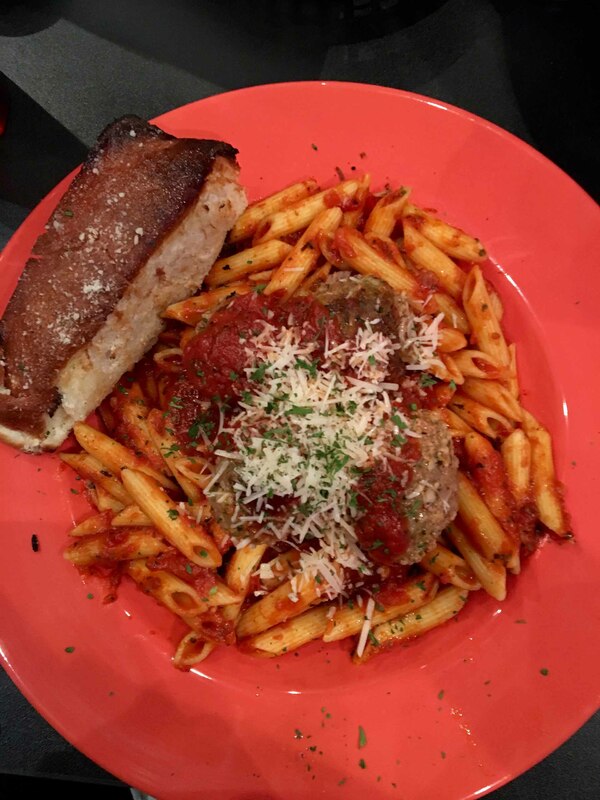 Hilary Hulsey ordered the Moondoggy Meatball pasta because that's her test of an Italian spot. A heaping helping came to our table: penne pasta in marinara, topped with meatballs of veal and beef. The menu boasted wide array of sandwiches and salads, as well. So you have choices. Today, Reynolds told us that development of the concept's third location is under way now at Amarillo Netplex, 4101 Hillside Road, an area as yet somewhat underserved by restaurants. The trio also is behind Off The Hook, a seafood restaurant slated to open in the next few months on the second floor of the Woolworth Building. The Esquire Jazz Club, the ground-floor next-door neighbor to Moondoggy's, opened there on New Year's Eve. New Commerce Partners reclaimed the Woolworth name for the structure in 2016. It had for many years housed the U.S. Bankruptcy Court. New Commerce is a real estate investment limited partnership that's an outgrowth of the PRANA GP limited liability company. PRANA includes commercial real estate broker Joe Bob McCartt and amarillo attorney Alan Rhodes. Amarillo architect Gregg Bliss created the design for the building. Reynolds said Amarillo has welcomed the DRJ entrepreneurs. "When they say Amarillo embraces, they mean Amarillo embraces."